This is an exciting time for our university. The N150 celebration, recognizing the founding of the University of Nebraska in 1869, is an opportunity to challenge ourselves in transformative ways. 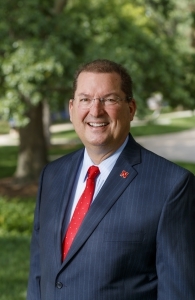 Chancellor Green defined the “N150 Challenge” in his Jan. 15 State of the University address, asking us to imagine the University of Nebraska-Lincoln as a world-leading, 21st-century land-grant university and unveiling a bold vision for the next 25 years. The strong land-grant research mission that is central to this vision is a big part of what attracted me to Nebraska. The growth in research expertise and funding that has occurred over the past 25 years is remarkable. Charting a course for the next 25 years is an exciting challenge. In his address, the chancellor described Nebraska’s rich research history and how it tripled research expenditures from 1994 to 2019, which led to our ranking as one of the fastest-growing comprehensive research universities in the nation. Thanks to your success in conducting cutting-edge research and discovery across a wide range of fields, we passed $308 million in total research expenditures in the past year, a 25 percent increase over the past decade. Faculty from every college have contributed to this university’s research growth, and their strong leadership has driven our accomplishments. Major contributors include agriculture and plant sciences; food and water security; early childhood education and development; physics; materials and nanoscience; and social and behavioral sciences. To be a world-leading land-grant research university, we must connect with our state and the world. Economic development efforts are critical to this outreach. Nebraska Innovation Campus, designed to stimulate collaborative research, experiential learning and economic growth, is broadening our research base through public, private and philanthropic partnerships. These partnerships expand our knowledge, drive the economy and increase our standard of living. They grow expertise in Nebraska, helping us attract and retain the best faculty. And they stimulate research and creative activity, providing distinctive experiences for students. The goal for research success outlined by Chancellor Green and the Nebraska Commission of 150 is ambitious: a research, scholarship and creative activity enterprise that approaches $450 million total research expenditures by 2025. Building basic research and creative work that has global reach. Building translational research that yields partnerships for public well-being and economic growth. Undertaking grand challenges that transcend disciplines and achieve breakthroughs in key areas. Surpassing the top 50 U.S. research universities in research opportunities for graduate students and postdocs. Conducting community-based research in each college. Expanding public-private partnership internships for students. I encourage you to read the commission’s full report. This month, the chancellor will assemble an N150 Strategy Team to develop the initial five-year implementation of the N150 Vision. At the same time, the Office of Research and Economic Development needs your ideas for achieving the N150 research and economic development goals. ORED is hosting listening sessions from Feb. 1-March 8 that will help shape our efforts to grow research, scholarship, creative activity and economic development through 2025. I highly encourage you to attend the open-topic sessions and the focused sessions on research strategies and ORED programs, services and resources. Ultimately, our success depends on your innovative ideas. You are the experts, and we want to hear your views. I hope you will participate. This is your opportunity to help define the university’s land-grant mission for the next 25 years. Together, we will imagine a bold future for research at Nebraska.